The ability to produce transgenes for Caenorhabditis elegans using genomic DNA carried by fosmids is particularly attractive as all of the native regulatory elements are retained. Described is a simple and robust procedure for the production of transgenes via recombineering with the galK selectable marker. Zhang, Y., Kashyap, L., Ferguson, A. A., Fisher, A. L. The Production of C. elegans Transgenes via Recombineering with the galK Selectable Marker. J. Vis. Exp. (47), e2331, doi:10.3791/2331 (2011). The creation of transgenic animals is widely utilized in C. elegans research including the use of GFP fusion proteins to study the regulation and expression pattern of genes of interest or generation of tandem affinity purification (TAP) tagged versions of specific genes to facilitate their purification. Typically transgenes are generated by placing a promoter upstream of a GFP reporter gene or cDNA of interest, and this often produces a representative expression pattern. However, critical elements of gene regulation, such as control elements in the 3' untranslated region or alternative promoters, could be missed by this approach. Further only a single splice variant can be usually studied by this means. In contrast, the use of worm genomic DNA carried by fosmid DNA clones likely includes most if not all elements involved in gene regulation in vivo which permits the greater ability to capture the genuine expression pattern and timing. To facilitate the generation of transgenes using fosmid DNA, we describe an E. coli based recombineering procedure to insert GFP, a TAP-tag, or other sequences of interest into any location in the gene. The procedure uses the galK gene as the selection marker for both the positive and negative selection steps in recombineering which results in obtaining the desired modification with high efficiency. Further, plasmids containing the galK gene flanked by homology arms to commonly used GFP and TAP fusion genes are available which reduce the cost of oligos by 50% when generating a GFP or TAP fusion protein. These plasmids use the R6K replication origin which precludes the need for extensive PCR product purification. Finally, we also demonstrate a technique to integrate the unc-119 marker on to the fosmid backbone which allows the fosmid to be directly injected or bombarded into worms to generate transgenic animals. This video demonstrates the procedures involved in generating a transgene via recombineering using this method. Many transgenes used in the generation of transgenic C. elegans consist of promoter sequences and perhaps a gene cDNA cloned into one of the vectors generated by the lab of Dr. Andy Fire 1. While these transgenes are often successful with regards to producing a GFP reporter gene or expressing a cDNA in a desired pattern, these transgenes can lack the alternate promoters, enhancer elements, and 3' untranslated region (UTR) elements which play important roles in the control of gene expression in vivo 2. For example, both the daf-12 and fah-1 genes have important enhancer elements which lie outside of the proximal promoter which were missed in promoter only constructs 3,4,5. Further many transgene constructs use the unc-54 3'UTR which prevents regulation by the appropriate microRNA genes 6,7,8. Consequently, generating transgenes with large segments of worm genomic DNA would be ideal for capturing all of promoters, splice variants, and 3' UTR control elements. Recently a C. elegans fosmid library which consists of ~40 kb regions of genomic DNA and covers almost all of the genome has been constructed. The use of worm genomic DNA carried by these fosmid DNA clones results in the greater ability to capture the genuine expression pattern and timing of specific genes 2,8,9,10,11. However, working with large regions of genomic DNA poses practical challenges such as the great difficulties in using standard molecular biology techniques 12. To overcome these limitations, techniques to modify fosmids or bacterial artificial chromosomes via homologous recombination in E. coli have been developed and are termed recombineering 12,13. Recombineering allows the seamless insertion of GFP, a tandem affinity purification (TAP)-tag, or other sequences of interest into any location in the gene carried by the C. elegans fosmid clone 2,10,14. 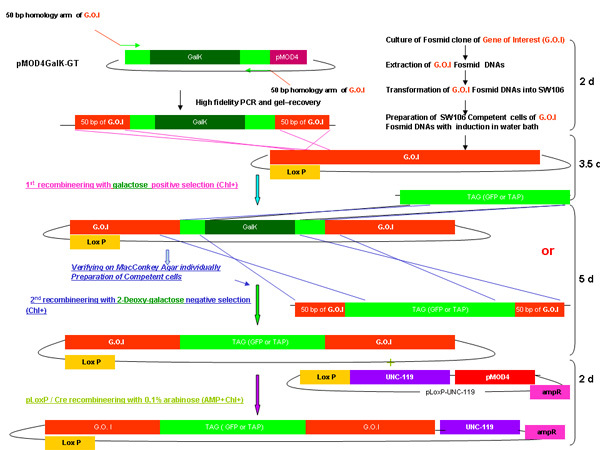 Homologous recombination occurs between a PCR product flanked by 50 bp regions of homology to the target site and the target DNA in specially modified E. coli strains. We have recently described a two-stage procedure for the modification of C. elegans fosmids by recombineering which involves inserting the galK gene at the desired location and then replacing this gene with the desired sequence 2. The galK gene serves as an effective selection marker for both steps in the process as it can be selected for and against via the use of selective growth medium 15. In the first stage of fosmid modification, the galK gene is inserted via homologous recombination at the desired location, and the correctly modified fosmids identified by positive selection for the ability to utilize galactose as a carbon source 2,15. In the second stage, the galK gene is replaced by the desired sequence, and the correctly modified fosmids are identified through negative selection against the galK gene through use of the toxic galactose derivative deoxygalactose which kills galK+ bacteria 2,15. An advantage of the galK is the ability of a single gene to be used for the positive and negative selection steps, instead of other markers which have separate genes for each step, and results in obtaining the desired modification with high efficiency 2,15. To facilitate the application of this technique to C. elegans research, we made several changes to the available resources. First, the GFP and TAP tags are commonly used to generate worm transgenes, so we built in 50 bp regions of homology to each of these tags into the pMOD4 galK-G and pMOD4 galK-GT plasmids which serve as the source of the galK gene 2. These regions allow a single set of oligos to be used for both stages of the fosmid modification which saves the need to order a second set of somewhat expensive oligos. Second, these plasmids use the R6K replication origin which precludes the need for digesting the parent plasmid or extensive PCR product purification as the parent plasmid is not able to replicate in the bacteria used for recombineering, and can only replicate in special strains such as EC100 2,16 (Table 1 and Table 2). Finally, a common way of generating transgenic C. elegans is through the use of biolistic bombardment followed by selection for transgenic worms via the rescue of the unc-119 mutation 17. To make the fosmids compatible with bombardment, we developed the pLoxP unc-119 plasmid which can be used to integrate the unc-119 marker on to the fosmid backbone 2. With recombineering the desired sequences can be inserted at any site within the gene. Common sites are at the 5' end or 3' end depending on functional domains, splice variants, or post-translational modifications such as cleavage by proteases. The pMOD4 GFP plasmid created by our lab can be used to insert a FLAG-tagged GFP at any site as the plasmid includes an initiator codon and lacks a 3' stop codon (Figure 1). In contrast, the TAP tag has specific versions for 5' and 3' fusions due to TEV cleavage used during purification 18,19. Plan the site of tag insertion within the gene. Consider alternate promoters, functional domains, alternative slicing, and post-translational modifications when considering the insertion site. Different insertion sites could be used to tag all, one, or some isoforms of a specific gene. Identify 50 bp regions upstream and downstream of the insertion point. Design the oligos (Table 1). Either 100 nM scale - gel purified oligos or Ultramer oligos from Integrated DNA Technologies can be used for the procedure. To perform galK recombineering, you need to design galK primers with 50 bp homology to an area flanking the desired site to be modified and the 3' end of these primers bind to the galK cassette, which is present in both pMOD4 galK-G and pMOD4 galK-GT (Figure 1). The forward oligo will be 5'-------50 bp homology -------CCTGTTGACAATTAATCATCGGCA-3' and the reverse one as 5'-------50 bp homology on the complementary strand ------- TCAGCACTGTCCTGCTCCT-3'. Generate a set of flanking oligos for PCR in later steps as well as for sequencing of the fosmid. These are standard PCR oligos which should bind ~100 bp upstream and downstream of insertion site. The fosmids from the C. elegans fosmid library are provided in the EPI300 bacterial strain (F-mcrA Δ(mrr-hsdRMS-mcrBC) φ80dlacZΔM15 ΔlacX74 recA1 endA1 araD139 Δ(ara, leu)7697 galU galK λ- rpsL nupG trfA tonA) (Epicentre Biotechnologies, Madison, WI) which allows the fosmid expression to be increased above a single copy per cell to improve DNA yields during purification (Table 2). For recombineering, the fosmid will need to be transferred to the SW106 bacterial strain (mcrA Δ(mrr-hsdRMS-mcrBC) ΔlacX74 deoR endA1 araD139 Δ(ara, leu) 7697 rpsL recA1 nupG φ80dlacZΔM15 [λc1857 (cro-bioA)<>Tet] (cro-bioA)<>araC-PBAD Cre ΔgalK) (NCI-Frederick) strain which carries the λred homologous recombination genes under the control of a temperature sensitive λ repressor and an arabinose inducible cre recombinase (Table 2) 15. Order the fosmid clone of Gene of interest (G.O.I.) from GeneService (Cambridge, UK) using Wormbase as a guide. When selecting clones, we choose ones that have the G.O.I. in the center of the sequence. Ones that exclude neighboring genes might be preferable but could be hard to find. Culture the fosmid clone of the G.O.I. in LB containing 12.5 μg/mL chloramphenicol at 37°C. Grow a 1.5 mL overnight culture of the fosmid, and mini-prep the fosmid DNA using the Epicentre fosmid prep kit (Epicentre Biotechnologies, Madison, WI). We follow the alternate protocol described in the instructions which involves adding the Riboshredder mix at an earlier step. Determine the fosmid DNA concentration with a spectrophotometer. Prepare the electrocompetent SW106 cells by growing a 5 ml overnight culture of SW106 in a 14 mL snap-cap tube with LB broth with 12.5 μg/mL chloramphenicol at 32°C. Inoculate 1 mL into 100 mL of LB with chloramphenicol in a 2 L flask. Grow SW106 bacteria to an OD600 0.6-0.8. Do NOT heat-shock. Pellet by centrifugation at 5000xg for 5 minutes, resuspend the pellet by gentle vortexing, and add 50 mL ice-cold 10% glycerol. Repeat this wash step once. Resuspend the pellets by gentle vortexing. Freeze 100 μl aliquots in liquid nitrogen or on dry ice, and store at -80°C for future use. Transform the fosmid DNA into electrocompetent SW106 cells by electroporating the bacteria with ~50 ng of fosmid DNA using an Eppendorf 2510 electroporator at 1350 volts in 0.1 cm gap cuvettes. Recover bacteria in 1 mL LB for 1 hour at 32°C. Plate aliquots on LB plates with chloramphenicol (12.5 μg/mL) and incubate at 32°C overnight. Verify the presence of the G.O.I. by colony PCR. Grow a 5 mL overnight culture in LB with 12.5 μg/mL chloramphenicol at 32°C. Add 0.5 μL of culture to a standard PCR reaction with the flanking oligos, and increase the initial 95°C incubation to 5 minutes to lyse the bacteria prior to PCR. Prepare a glycerol stock for long-term storage. In the first stage of fosmid modification, the galK gene is inserted into the fosmid by homologous recombination, and the correctly modified fosmids are selected for by growth on minimal media containing galactose as the sole carbon source (Figure 2A). The SW106 bacteria grow slowly on the minimal media and 3-5 days are required to see colonies. Prepare MOPS minimal media plates containing 0.2% galactose. MOPS minimal media is available from Teknova Inc. (Hollister, CA) (catalog #M2106) but do not use the included glucose. PCR amplify the pMOD4 galK-G or pMOD4 galK-GT cassettes using the primers designed above. We have used Phusion (New England Biolabs, Ipswich, MA) or GoTaq (Promega, Madison, WI). Gel purify the resulting band. Quantify the yield by gel or Nanodrop spectrophotometer. This PCR product is ready for step 3.14. Inoculate an overnight culture of SW106 cells containing the fosmid DNA in 5 ml LB with chloramphenicol (12.5 μg/μL). Grow at 32°C. Set shaking water bath to 42°C to warm-up with a sterile 250 ml flask in the holder. Use of a shaking water bath is critical for getting high efficiency. Add 1 ml of overnight culture to 100 ml of LB and chloramphenicol in a 2 L flask. Grow to an O.D. 0.6-0.8. This usually takes 3-4 hours. Transfer 50 ml of SW106 cells to the 250 ml flask and heat-shock at 42°C for exactly 20 min. in a shaking waterbath at 100 r.p.m. Leave the remaining bacteria at 32°C as the uninduced control. Cool the induced and uninduced bacteria on ice for 10 minutes. Transfer the samples to two sterile centrifuge tubes and pellet at ~5000xg for 5 minutes. Pour off all of the supernatant and resuspend the pellet in 1 ml ice-cold 10% glycerol by gentle vortexing (i.e. setting 3-4). When resuspended, add another 49 ml ice-cold 10% glycerol, and pellet the samples at ~5000xg for 5 minutes. Repeat step 3.9, 3.10, and 3.11 again. Remove all supernatant by inverting the tubes, and resuspend the pellet in the remaining liquid (approximately 500 μL each). Aliquot into 100 μL samples, freeze on dry ice, and store at -80°C. These are good for weeks to months. (We usually stop here and perform the electroporation the following day). Electroporate the induced and uninduced SW106 cells with 150 ng of PCR product using 0.1 cm gap cuvettes in an Eppendorf 2510 electroporator set at 1350 volts. Recover the bacteria in 1 mL LB in a 14 ml Falcon tube. Incubate at 32°C for 4.5 hours. Pellet the bacteria in a microfuge at 13,200 r.p.m. for 15 seconds. The bacteria are resuspended in M9 and then washed twice remove any rich medium (see below for recipe). After the second wash, the supernatant is removed and the pellet is resuspended in 1 mL M9 before plating serial dilutions in M9 (100 μL, 100 μL of a 1:10 dilution, and 100 μL 1:100) onto MOPS minimal media. Incubate 3-5 days at 32°C in an incubator. Note: Be patient as the true positives grow slowly. Streak a few colonies onto MacConkey agar indicator plates (BD #281810) supplemented with 1% galactose and chloramphenicol 12.5 μg/mL. All of the colonies appearing after the last step should be galK+, but in order to get rid of any galK- contaminants, it is important to obtain single, bright pink colonies before proceeding to the second step. The galK- colonies will be white/colorless and the galK+ bacteria will be bright red/pink due to a pH change resulting from fermented galactose after an overnight incubation at 32°C. Pick a single colony and inoculate a 5 ml LB + chloramphenicol overnight culture for growth at 32°C. Confirm insertion of the galK gene at the proper location via PCR using the flanking oligos. Add 0.5 μL of the culture to a standard PCR reaction and increase the initial 95°C incubation to 5 minutes to lyse the bacteria. The PCR product should be upshifted in size due to the presence of the galK gene. Prepare a glycerol stock for storage. In this stage the galK gene is replaced by the desired tag sequences and the correctly modified fosmids are selected for by selection against the galK gene by the toxic galactose analog deoxygalactose (DOG) (Figure 2B). Prepare MOPS minimal media plates containing 0.2% deoxygalactose (DOG) and 0.2% glycerol. MOPS minimal media is available from Teknova Inc. (Hollister, CA) (catalog #M2106) but do not use the included glucose. PCR amplify the tag fragments from pMOD4 GFP, pBS1761 (N-term TAP), or pBS1479 (C-term TAP) using the same oligos used in the first round or using shorter GFP or TAP-specific oligos (the inner sequences in step 1.2). If you are making multiple constructs, it is particularly useful to use the shorter oligos as the same PCR product can be used for all of the constructs. Gel purify the PCR product and measure the concentration via gel or spectrophotometry. Generate induced and uninduced competent SW106 carrying the fosmid with the galK gene inserted following steps 3.4-3.13 above. Electroporate the induced and uninduced SW106 cells with ~100 ng of PCR product using 0.1 cm gap cuvettes in an Eppendorf 2510 electroporator set at 1350 volts. Recover in 1 ml LB in a 14 ml snap-cap tube and incubate in a 32°C shaker for 4.5 hours. Wash and dilute bacteria as in steps 3.16 and 3.17. Plate bacteria on MOPS minimal media plates containing 0.2% 2-deoxy-galactose (DOG) and 0.2% glycerol. Incubate at 32°C for three days. Four colonies are used to make 5 mL overnight cultures in LB with 12.5 μg/mL chloramphenicol. These are used for colony PCR as above to confirm that the cassette was inserted. We use both the shorter GFP/TAP specific oligos and the flanking oligos to demonstrate the right insert and right site. GFP is ~800 b.p. and TAP is ~550 b.p. whereas galK is 1.4 kb. A common means of generating transgenic animals with the modified fosmids is through the use of biolistic bombardment. This technique uses DNA-coated gold particles to introduce fosmid DNA into C. elegans. Transgenic animals are usually identified via rescue of the unc-119 mutant with an unc-119 transgene. In this step, the unc-119 gene is added to the fosmid backbone in cis by cre-loxP recombination with the pLoxP unc-119 plasmid (Figure 2C). Prepare competent SW106 bacteria carrying the modified fosmid from step 4.9 using steps 2.5-2.9. Do NOT induce at 42°C. Electroporate with 50 ng. pLoxP unc-119 from a mini-prep using 0.1 cm gap cuvettes in an Eppendorf 2510 electroporator set at 1350 volts. Recover bacteria in LB containing 0.1% arabinose for 1 hour at 32°C. Plate aliquots on LB plates containing 50μg/mL ampicillin and 12.5 μg/mL chloramphenicol. Incubate at 32°C overnight. which selects for integration of pLoxP unc-119 into the fosmid. Grow an overnight culture in LB containing 50μg/mL ampicillin and 12.5 μg/mL chloramphenicol. Use 0.5 μL for PCR verify the presence of the unc-119 gene with the unc-119 F (5'-CAAATCCGTGACCTCGACAC-3') and unc-119 R (5'-CACAGTTGTTTCTCGAATTTGG-3') oligos (Table 1). Make a glycerol stock of the final fosmid. To facilitate obtaining the larger quantities of fosmid DNA needed for bombardment, in this step the fosmid is transferred to the EPI300 bacteria. This strain has the ability to increase the fosmid copy number to increase yields during DNA preparation. Grow a 5 mL overnight culture of the bacteria from step 5.5 in LB containing ampicillin and chloramphenicol at 32°C. Use Epicentre fosmid prep kit to isolate the fosmid from 1.5 mL of culture. Electroporate ~50 ng into the EPI300 bacteria using 0.1 cm gap cuvettes in an Eppendorf 2510 electroporator set at 1350 volts. The EPI300 bacteria can be purchased from Epicentre Biotechnologies (Madison, WI). Recover bacteria in LB for 1 hour at 37°C. Plate aliquots on LB agar containing 50 μg/mL and 12.5 μg/mL chloramphenicol. Grow and induce the EPI300 bacteria containing the modified fosmid using the included instructions. A 50 mL induced culture will give >10 μg of purified fosmid DNA. Purify the fosmid with the Epicentre fosmid prep kit. Use 10 μg. of fosmid DNA to bombard the DP38 worm strain as described (D. Hochbaum, A. Ferguson, and A. Fisher, JoVE, in press). The modification of fosmids via recombineering robust and success rates of >90% in the negative selection step are routinely observed 2. This protocol also takes ~2 weeks to complete which makes the preparation of transgenes fairly rapid. The protocol has also been tried by other labs with success 20. Table 2. Strain and vector availability. 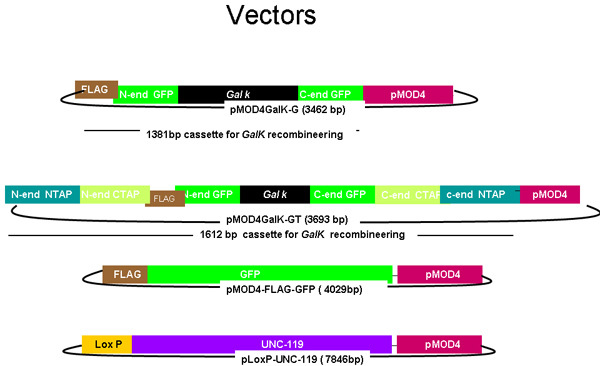 The pMOD4-galk-G plasmid consists of the galK cassette (black) flanked by 50 nucleotide regions identical to the 5' and 3' ends of FLAG(Brown)-GFP (green) while pMOD4-galK-GT consists of the galK cassette flanked by both the FLAG-GFP homology regions and 50 nucleotide regions identical to the 5' and 3' ends of N-terminal and C-terminal TAP (blue and orange, respectively). pMOD4-FLAG -GFP consists of the full GFP cassette with a 5' FLAG tag and pLoxP unc-119 consists of the unc-119 genomic sequence (purple) in a plasmid containing a loxP site. All plasmids utilize the R6K-based pMOD4 (red) backbone which is unable to replicate in SW106. Figure 2A -2C Separate figures showing the steps and time involved in recombineering using the galK cassette. These are the same figures that are merged in figure 2d, but provided separately for clarity and ease of reading. A fosmid of interest is first modified in a two-step procedure involving the insertion of the galK cassette flanked by 50 bp regions of homology to FLAG-GFP or TAP (Figure 2A) followed by replacement of this cassette by FLAG-GFP or TAP ( Figure 2B). Later the unc-119 marker for use in generating transgenic animals is inserted into the LoxP site on the fosmid backbone (Figure 2C). Figure 2D shows a merged figure of galK recombineering procedure. Outline of galK recombineering procedure as described in the above including time required for each step from merging Figure 2A-2C. Figure 2a. The galk insertion in galk recombineering. Figure 2b. The TAG (GFP /TAP) insertion in galk recombineering. Figure 2c. The addition of unc-119. Figure 2d. The merged overview of galk recombineering. The generation of transgenes from fosmids offers the benefit of retaining all of the native promoter elements, splice variants, and 3' UTR regulatory elements. This can lead to the construction of a transgene which is more reflective of the native expression pattern, or the construction of a functional transgene when other approaches fail 5. The resulting transgenes can carry a variety of epitope tags including GFP or a TAP tag. The construction of transgenes involved three steps which are all carried out in the SW106 bacterial stain 15. First, the galK gene is integrated into the desired site in the fosmid to be modified through recombineering with a PCR product carrying galK flanked by homology arms complementary to the target fosmid. An improvement we developed is the integration of homology regions for either FLAG-GFP or a TAP tag into the galK cassette allowing a single set of oligos to be used for the first and second steps of fosmid modification and lowering the cost of oligos. A further simplification is the use of an R6K-based vector, which is unable to replicate in the SW106 bacterial strain and eliminates the need to digest the parent vector. Second, the galK cassette is replaced with tags such as GFP or TAP which are then fused with the gene of interest on the fosmid. This step is very robust and many correctly modified fosmids are routinely obtained. Finally, the unc-119 selectable marker for the generation of transgenic worms is added to the fosmid. This creates a marker in cis and directly linked to the modified fosmid. The unc-119 selectable marker is widely and compatible with both microinjection and biolistic bombardment 17,21. Bombardment is particularly useful as significant numbers of transgenic lines can be generated by a single trial and even inexperienced personnel can create transgenic animals. A key aspect of this protocol is the use of a shaking water bath incubator for the heat shock steps during the preparation of SW106 competent cells. We found that use of an air incubator was unable to heat the bacterial culture to 42°C even after 30 minutes in the shaker (not shown). We also tried immersing the bacteria in a water bath with suboptimal results (not shown). A shaking water bath can be purchased used from a number of companies if not already available in the lab. Beyond the insertion of GFP or epitope tags, we have also started to use this technique for site-specific mutagenesis of worm genes carried on fosmids (A. Ferguson and A. Fisher, unpublished). This was accomplished via the use of a single-stranded oligo containing the change flanked by 50 bp upstream and downstream of the site to replace the galK gene. The combination of fosmid mutagenesis coupled with the use of a gene knockout mutant could allow the in vivo function of particular gene isoforms, domains, or specific amino acids to be determined. Further our protocol removes the galK marker at the end so it is possible to perform additional rounds of modification to insert additional epitope tags or perform mutagenesis on a tagged construct. Finally, it is likely that some of these reagents can be used in the construction of modified BACs or fosmids by labs not using worms. The pMOD4 galK-G and pMOD4 galK-GT genes still retain the entire galK gene so previously published oligos can still be used to amplify the galK gene 15. This will still retain the benefits of using the R6K replication origin with regards to not needing to digest the parent plasmid or carefully purify the PCR product. The authors would like to thank Lindsey Nash for help with developing the technique. 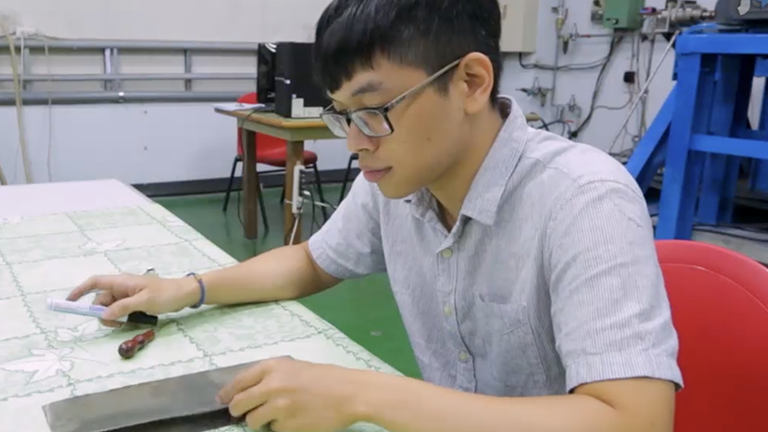 This work was funded by NIH grant AG028977 to A.L.F., a pilot project grant from the University of Pittsburgh OAIC (AG024827), and seed funds from the University of Pittsburgh. Mello, C., Fire, A. DNA transformation. Methods Cell Biol. 48, 451-482 (1995). Zhang, Y., Nash, L., Fisher, A. L. A simplified, robust, and streamlined procedure for the production of C. elegans transgenes via recombineering. BMC Dev Biol. 8, 119-119 (2008). Antebi, A., Yeh, W. H., Tait, D., Hedgecock, E. M., Riddle, D. L. daf-12 encodes a nuclear receptor that regulates the dauer diapause and developmental age in C. elegans. Genes and Development. 14, 1512-1527 (2000). Snow, M. I., Larsen, P. L. Structure and expression of daf-12: a nuclear hormone receptor with three isoforms that are involved in development and aging in Caenorhabditis elegans. Biochim. Biophys. Acta. 1494, 104-116 (2000). Fisher, A. L., Page, K. E., Lithgow, G. J., Nash, L. The Caenorhabditis elegans K10C2.4 Gene Encodes a Member of the Fumarylacetoacetate Hydrolase Family. A CAENORHABDITIS ELEGANS MODEL OF TYPE I TYROSINEMIA. J Biol.Chem. 283, 9127-9135 (2008). Wightman, B., Ha, I., Ruvkun, G. Posttranscriptional regulation of the heterochronic gene lin-14 by lin-4 mediates temporal pattern formation in C. elegans. Cell. 75, 855-862 (1993). Lehrbach, N. J. LIN-28 and the poly(U) polymerase PUP-2 regulate let-7 microRNA processing in Caenorhabditis elegans. Nat Struct Mol Biol. 16, 1016-1020 (2009). Tursun, B., Cochella, L., Carrera, I., Hobert, O. A toolkit and robust pipeline for the generation of fosmid-based reporter genes in C. elegans. PLoS One. 4, e4625-e4625 (2009). Bamps, S., Hope, I. A. Large-scale gene expression pattern analysis, in situ, in Caenorhabditis elegans. Brief. Funct. Genomic. Proteomic. (2008). Dolphin, C. T., Hope, I. A. Caenorhabditis elegans reporter fusion genes generated by seamless modification of large genomic DNA clones. Nucleic Acids Res. 34, e72-e72 (2006). Sarov, M. A recombineering pipeline for functional genomics applied to Caenorhabditis elegans. Nat. Methods. 3, 839-844 (2006). Yang, X. W., Model, P., Heintz, N. Homologous recombination based modification in Escherichia coli and germline transmission in transgenic mice of a bacterial artificial chromosome. Nat Biotechnol. 15, 859-865 (1997). Court, D. L., Sawitzke, J. A., Thomason, L. C. Genetic engineering using homologous recombination. Annu.Rev.Genet. 36, 361-388 (2002). Westenberg, M., Bamps, S., Soedling, H., Hope, I. A., Dolphin, C. T. Escherichia coli MW005: lambda Red-mediated recombineering and copy-number induction of oriV-equipped constructs in a single host. BMC Biotechnol. 10, 27-27 (2010). Warming, S., Costantino, N., Court, D. L., Jenkins, N. A., Copeland, N. G. Simple and highly efficient BAC recombineering using galK selection. Nucleic Acids Res. 33, e36-e36 (2005). Penfold, R. J., Pemberton, J. M. An improved suicide vector for construction of chromosomal insertion mutations in bacteria. Gene. 118, 145-146 (1992). Praitis, V., Casey, E., Collar, D., Austin, J. Creation of low-copy integrated transgenic lines in Caenorhabditis elegans. Genetics. 157, 1217-1226 (2001). Puig, O. The tandem affinity purification (TAP) method: a general procedure of protein complex purification. Methods. 24, 218-229 (2001). Rigaut, G. A generic protein purification method for protein complex characterization and proteome exploration. Nat.Biotechnol. 17, 1030-1032 (1999). Achilleos, A., Wehman, A. M., Nance, J. PAR-3 mediates the initial clustering and apical localization of junction and polarity proteins during C. elegans intestinal epithelial cell polarization. Development. 137, 1833-1842 (2010). Maduro, M., Pilgrim, D. Identification and cloning of unc-119, a gene expressed in the Caenorhabditis elegans nervous system. Genetics. 141, 977-988 (1995).